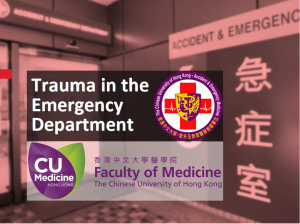 With help from the Micro-Module Courseware Development Grant Schemes of the Chinese University of Hong Kong, we are able to develop Management of Trauma in the Emergency Department. The component-based narrated slides include interactive material that will guide students through a scenario, set tasks for student to work through whilst challenging their knowledge and analytical ability. This is followed by simulation training and clinical attachment for two weeks at our Emergency Department. This project fills a major knowledge gap in the undergraduate medical curriculum. 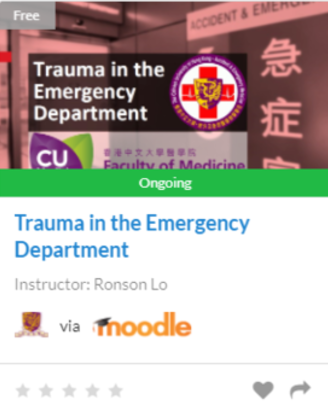 Previous informal didactic teaching has now been transformed into formal teaching syllabus during medical student’s rotation at Emergency Medicine. CUHK Medical students may access this material through Blackboard. Others may access this material through KEEP.